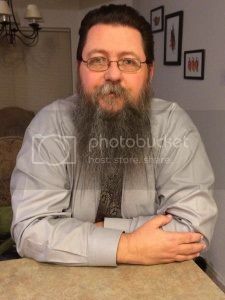 Check out the latest fantasy book coming from author C. S. Boyack. Then, be sure to read the excerpt below. YOu just might like the book. An honorable man is mistaken for his disreputable father. Now he's pushed into a political scheme to start a war that will spread across multiple kingdoms. James Cuttler's fiancé is being held captive to ensure he goes through with the plan. He soon decides his skills are at sea and procures a ship to wage war upon those who disrupted his simple life. He can't do it alone, so he recruits a band of cutthroats to help him. But first, they need guns and munitions to outfit the ship properly. Deception and trickery will only get them so far. Eventually, they're going to have to engage the enemy. James' goals aren't necessarily the same as his crew. It's a delicate balancing act to collect enough loot to keep his crew happy, while guiding them back to rescue the girl. 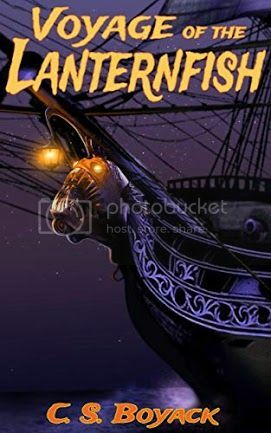 Voyage of the Lanternfish is filled with adventure, magic, and monsters. Lots of monsters. Hoist the colors and come along for the ride. Fala nudged Dan with her shoulder, then fed the anvil bird a red berry. As they rounded the corner onto the docks, the ship came back into view. Gold letters nearly two feet tall arched across her stern. They read, Lanternfish. Dock workers lugged items aboard the ship, rolls of canvas, kegs of gunpowder, live pigs, and more. A glazer worked on the large lanterns attached around the poopdeck. Stuttering Lewis hung over the stern on a bosun's chair, and carved a log that replaced the supporting statue they'd destroyed when they took her. Rather than a lady with a vase, he was making a skeletal pirate, complete with a branch that became an arm holding a cutlass. McCormack sat at a desk underneath an umbrella alongside the ramp up to the ship. He turned his journal around quickly. "Do you want to check it, ma'am?" "No need Mr. McCormack. Maybe later. Things look much improved around here." "Aye, ma'am. You look much improved too. Island life agrees with you." "That it does. We're going to have a look around, we'll report in this afternoon. Where's the captain?" "Could be in the tavern. That's where most business gets done around here." They walked the length of the ship. Underneath the bowsprit was a new figurehead made of riveted pieces of metal, like a suit of armor. It was a huge lanternfish. Circular white portholes served as eyes, and a long twisted steel rod protruded from his forehead. The rod arched until it was tangent with the bowsprit, then bent back down. At the end, a huge hexagonal lantern hung, it matched the others on the back of the ship. Long sharp teeth protruded from the creature's bulldog-like jaw, and the fish appeared to be hollow inside. The ship resembled an anthill. Men scurried everywhere, painting, tying new rigging, glazing, and more. When they turned back, a young woman approached McCormack's desk. The woman was tall, thin, and muscular. She wore a bamboo coulee hat that was wider than her shoulders. It was covered with a gauze beige cloth. Her features were Eastern, giving her an exotic beauty. She wore only short leather boots, and a leather pair of shorts. Her legs were covered with wrapped strips of beige silk up to her knees, as were her breasts, forearms, and fists. She thumped the bronze foot of her pole weapon on the dock then waited for McCormack to speak. The shaft of her weapon was ebony black. The curved blade of the glaive started above her head, and had but a single edge. As they walked closer, they made out a jade disk pendant around her neck, and the weapon had bronze fittings of a fierce dragon holding the blade in its mouth. The fittings served to add strength opposite the cutting edge. "What are you good at?" "Can you rig a sail?" "Sign here. Then find Don Velasco topside. He'll get you situated." Dan and Fala walked past. Serang's braided black hair hung to the small of her back, nearly touching her shorts. "Wonder what she does with that frog sticker?" Dan said. Serang spun around, took two running steps toward the side of the pier and threw her weapon like a spear. It sailed across the water to the next dock and impaled a huge bay frog that was sunning itself. "Stick frogs," she said. C. S. Boyack was born in a town called Elko, Nevada. He likes to tell everyone that he was born in a small town in the 1940s. He's not quite that old, but Elko has always been a little behind the times. This gives him a unique perspective of earlier times, and other ways of getting by. Some of this bleeds through into his fiction. Boyack moved to Idaho right after the turn of the century, and never looked back.His writing career was born here, with access to other writers and critique groups he jumped in with both feet. He likes to write about things that have something unusual. His works are in the realm of science fiction, paranormal, and fantasy. His goal is to entertain readers for a few hours and he hopes you enjoy the ride.